AQ-4200 package consists of outstanding performance Drinking Water Enhancement System AQ-4000 and Deluxe Shower Enhancement System AQ-4100. Great Offer and total healthy water way of living! 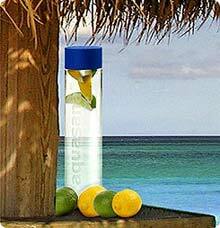 The Aquasana glass decanter is the perfect container to keep your filtered water in and ready to drink at all times. The glass decanters are also available for purchase if you would like more for work or the gym. No more plastic bottles in the land fills, Go Green - NO BOTTLE. Bottle your own filtered water. If you are interested in installing this system under the counter you may want to look at the undercounter systems. Aquasana is the #1 rated home water filtration system in America, works better & costs less than any other brand! The patented twin cartridge drinking water filter installs in seconds to standard kitchen faucets and provides up to 2 litres per minute of ultra-filtered high quality water for drinking, cooking and other beverages. Includes filter housing‚ chrome faucet diverter‚ twin filter cartridge set (lasts 6-8 months/filters 2000 litres) and easy to follow instructions. Replacement filters cost $79 every 6 months/2000 litres...that's less than 4¢ a litre/ $10.00 a month for a virtually unlimited supply of "healthy water". Replacement Filter - $79.00 every 6months or 2000 litres whichever comes first. Remember, each filter cartridge set can replace over 2000 single use plastic water bottles! "At the pull of a button, Aquasana transforms tap water into naturally healthy, great tasting drinking water!" The AQ-4100 Aquasana Shower Filter a truly amazing product, offers dramatic health & cosmetic benefits. 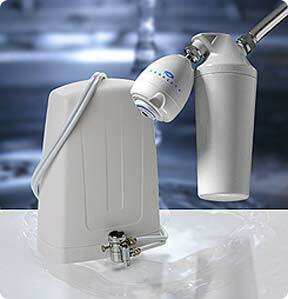 The Aquasana shower system filters out harmful chlorine while balancing the pH of the water. Installs in seconds without tools. Turn your shower into a natural spring waterfall for softer skin and healthier hair. The AQ-4100 Aquasana Shower Filter has a unique two-stage filter process for the healthiest shower possible. The first stage removes and enhances pH balance with a natural copper/zinc mineral media called KDF-55D. The second stage reduces synthetic chemicals and VOCs (volatile organic chemicals) through a carbonized coconut shell media. These synthetic chemicals and VOCs can be inhaled or absorbed through the skin, which may cause health or cosmetic effects. Can be used with water up to 50° C; 36° - 42° C is normal shower temperature. It is self-cleaning, and the non-aerated spray means less temperature loss between the showerhead and you. Your shower water will feel better, and be better for you! The Environmental Protection Agency (EPA) regulates how a small amount of chlorine is added or some other disinfection method is used to kill bacteria or microorganisms that may be in tap water. Excess exposure to chlorine can also be detrimental to your health. Chlorine steals moisture from skin and hair, causing excess dryness. Other health conditions caused by chlorine include respiratory condition such as asthma and bronchitis. Chlorine can also be re-vaporized in the shower, inhaled into the lungs and transferred directly into the blood system. Small children, infants and those with weak immune systems may also be susceptible to the damaging effects of highly-chlorinated tap water. Order now and in less than 1 week you'll be showering in naturally healthy, chemical free water! The Aquasana Shower Filter is the healthy solution to protect yourself from the damaging effects of chlorine. Replacement filters for the shower only $89.00 every 40,000 litres. The Aquasana Shower Filter is the healthy solution to protect yourself from the damaging effects of chlorine. The Aquasana Shower Filter is easy to install and comes complete its two-stage filter cartridge that last up to six months. Like any filter, whether it be the filter in your central heating and cooling system or the oil filter in your car, water filter cartridges must be replaced at the appropriate time in order to get the desired results. #1 rated Water Filter in America! Voted “Best Buy” by Consumers Digest Magazine 6 years in a row 2003 – 2008! "My friend recently purchased a drinking water filter from AquasanaUSA and is very pleased. She told me the benefits of removing chlorine and other harmful containments from my drinking water. I too, now own the Aquasana AQ-4000 and I am very pleased with my purchase." "The Aquasana® Shower Filtration System is one of the most unique and beneficial products ever developed." "It’s Like showering in natural spring water!" Jonathan Antin/Celebrity Hair Stylist, Host of Reality Show "Blow-Out"
"Installs in seconds and provides healthy filtered water for showering. The best shower you’ll ever take! I’d recommend it to anyone." "Offers tremendous benefits to people with skin conditions and breathing disorders. The benefits are immediate and very noticeable!"